It’s better to prevent the problem of fleas rather than have to get rid of them. Once fleas infest your cat, they are hard to get rid of. These small, six legged insects survive with a host such as a cat by feeding on the host’s blood. Garlic is a flea control that will not only repel fleas but will keep them away. Garlic is also a great all natural way of eliminating the problem of fleas. Garlic has been used since ancient times for food and medicine around the Mediterranean. It is said to cure many illnesses and encourages a long life. For your cat, a small dose will not only keep them healthy but will help keep fleas away. 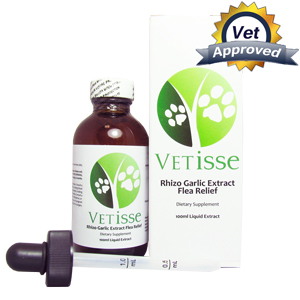 This garlic extract will also promote your cat’s cardiovascular health and help with some respiratory tract infections.Before taking this flea prevention it is best to consult your veterinarian first to see if your cat is eligible to be taking it. If your cat has a history of blood clots, diabetes, taking blood thinners, or other health problems, ask your veterinarian for advice before using this product. Your pet should not be taking this product prior to surgery, if they are using blood thinners, feeding their young, if they are pregnant, or if they suffer from pemphigus. There may be mild GI disturbances due to prolonged use of this product therefore it is recommended that pets take probiotics. This product does not have any known reactions but may cause health problems if too much is taken. Only provide your cat with the dosage recommended which is 1tsp once to twice a day.